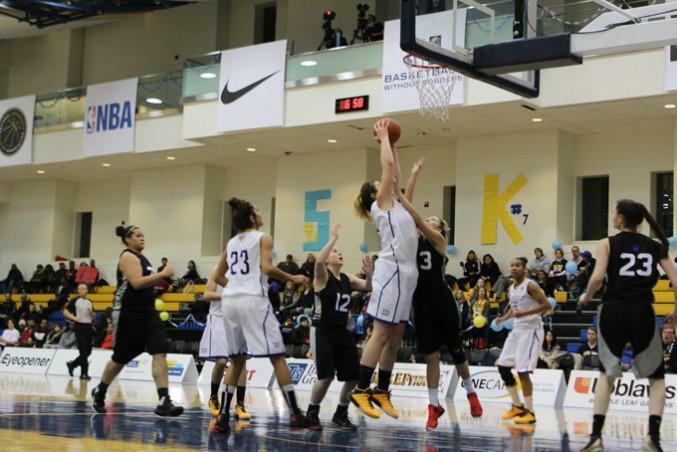 The Ryerson Rams women’s basketball team defeated the Algoma Thunderbirds 103-35 on Saturday night at the Mattamy Athletic Centre [MAC]. The Rams started out slow, unusual for a team known for its explosive starts, but the team hit their stride in the third and fourth quarters. The first quarter saw a lot of action from the Rams, who quickly racked up 29 points. Rams Keneca Pingue-Giles and Mariah Nunes – who took two turns at the free throw line – each scored five points in a matter of minutes. Algoma struggled to keep up with the Rams, but did manage to score 11 points near the end of the quarter. The Rams slowed down considerably in the second quarter, giving the Thunderbirds enough time to get 11 points on the board. The girls were losing their hustle until Sofia Paska nailed two solid shots, and soon the team was able to work their way up to score another 13 points. The Rams went into the fourth quarter with 42 points, but that all changed quickly. Nunes and Silvana Jez both reeled in the baskets while Algoma, scoring only 9 points, could barely keep up. It was the Rams’ Nicole DiDomenico who swooped in in the last few minutes scoring five baskets and bringing the team up to 74. “I thought we keyed in on some things defensively, especially in the second half,” Clarke said. Going into the fourth quarter Algoma was visibly slowing down and were behind the Rams by 43 points. The Ram’s Jez, Nunes and Pingue-Giles dominated the beginning of the quarter. Nunes, after making a daring breakaway, scored another two points for the team on a foul. The Rams worked flawlessly together and were quickly running up the score to the 90s in no time. The Thunderbirds struggled to keep up with the Rams, who with two minutes left in the game, scored seven points.